Today is Tisha B'Av, the saddest day of the Jewish year. The religious theme is that the Jewish people were not faithful to the Lord, but with a return to faith and observance will come redemption. It ends on a hopeful note. Especially now that the great exile is over and there is a Jewish state. But my mind went elsewhere. 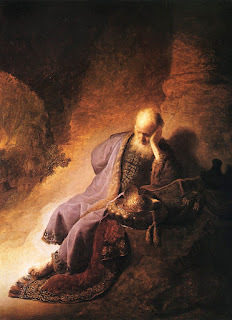 In Lamentations, Jeremiah discusses people - kings and priests even - dying by sword and plague. Mothers cannot feed their children and jackals emerge. A great vibrant city full of life is no more. Civilization, this vast edifice, appears strong. But so it appeared to the Romans until the Goths burst through. In some profound ways it is built on thin, weak bonds. Our financial system (to take one example) is based on the word of the United States government. When it comes to it, so much of our civilization is based on words - the weakest bond and yet the strongest. What if it isn't robust? True, as horrible as the World Wars were, civilization survived. But there were bastions far removed from the fighting to preserve. That same interconnected world that makes it all seem strong, would allow contagion to spread blindingly fast. Could a few bad policy decisions start to undo all that has been built, allowing the jackals to emerge? I would like to think not. The Jewish people survived that and much, much more, and our culture is built on words. But many other great civilizations fell and disappeared into the dust. The physical infrastructure that preserves lightning communications is pretty extensive. The resources and expertise to preserve would remain, too much depends on it. They are far stronger bonds than the old Roman roads. But of course the Romans couldn't imagine their world coming to end and bringing on the Dark Ages either.